Available in sizes from diameter 63mm to 710mm. The couplings can be used for the full range of temperatures and pressures, the same as Pexgol pipes. Pexgol flanged couplings consist of either two halves or four quarters depending on the pipe size. The body of the coupling is made of spheroidal cast iron GGG40 (ASTM A-536). The inner surface of the coupling has special stainless steel teeth. These teeth penetrate into the pipe wall during tightening of the coupling and provide good anchoring onto the pipe, preventing the pipe from pulling out from the fitting. 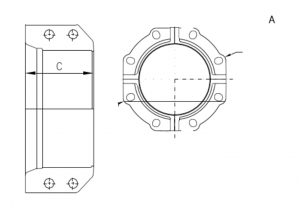 The flanged couplings are supplied with an integral gasket and bolts for connecting the two halves or four quarters. The gasket seals between the coupling and the pipe, and also between the coupling and the opposite flange. The gasket is designed so that the coupling does not come into contact with the liquid flowing through the pipe. The standard gasket is made of EPDM; other materials are applied according to special order. The flange has oval holes designed to fit most international standards; see table. Place the gasket on the pipe. Open the screws and apply anti seize lube. Place the coupling around the pipe and tighten the screws equally. Recommended: use of electric rattle guns. For connecting two flanged couplers use the table “Bolts for connecting 2 flanged couplings” if needed. A complete installation manual is available upon request. General dimensions of flanged couplings and bolts for connecting 2 quarters of coupler.